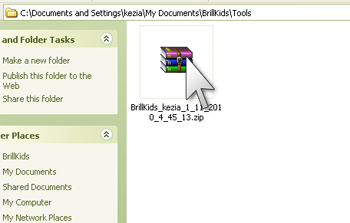 The Support Tools window lets you fix common playback problems instantly and in case you need further help, contacting BrillKids Support is just a few clicks away! Click on Create a Diagnostic Report to create a zip file containing information about your Little Musician. After clicking the button, a DOS window will appear, collecting your system information. Once finished, you will be shown a .zip file which will help us analyze and resolve your problem. Then, contact BrillKids Support and attach your Diagnostic Report to your Tech Support query and we'll get back to you as soon as possible! 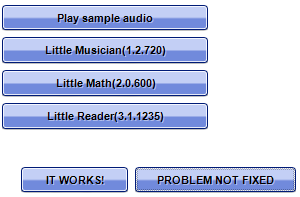 If you have a sound problem with Little Musician, click on Start Wizard to run the Audio Diagnostic Wizard which will help you fix any sound problems you are experiencing. Once the adjustment is finished, you may play a sample audio or go back to your BrillKids software to check if the problem was fixed. Click the It Works! button if your sound problem was fixed, and if not, click on the Problem Not Fixed button to continue making system adjustments. 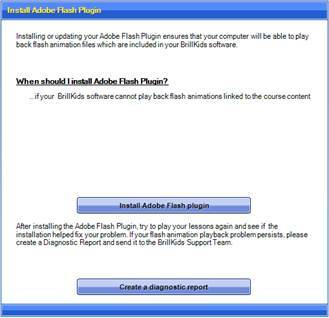 To play flash animations you must have Adobe Flash installed. If you have problems with your animations, click on Install Adobe Flash Plugin to install Adobe Flash. Sometimes, the reason why your Little Musician is not working properly is because of a problem in the Microsoft .NET Framework installed in your computer. Just click on Repair .NET Framework to resolve any issues in your .NET Framework instantly! 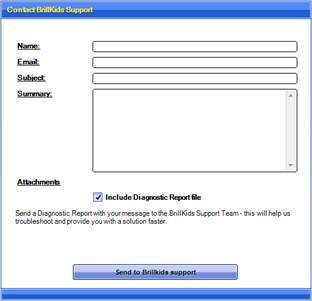 Report a problem to BrillKids Support by filling out a short form with your details along with a Diagnostic Report so that we can help you resolve your problem. 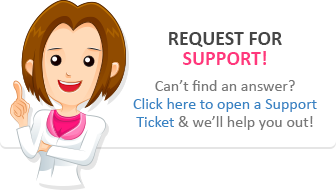 Make sure you check the box next to Include Diagnostic Report file before you click on Send to BrillKids Support to send out your report. We encourage you to send us your Error Report to help us know more about your problem. To report the problem, simply click on the Send Error Report button. 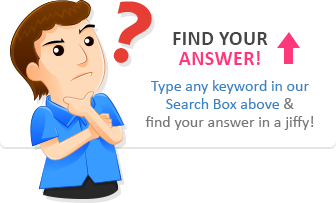 This will open another dialogue box which will ask you for more details. After adding your additional information about the error, remember to type in your email address or your forum username so that a BrillKids customer service representative can get back to you as soon as possible!